Clayton and Romey Ritter are our pastors. They have three beautiful kids, Liam, Jai, and Bella. They met in 1997 in Australia where Clayton was playing professional basketball and Romey was serving in a local church. They fell in love and married in 1999. In 2000 Clayton left his basketball career and Romey left her home country to follow the call of God to move to Clayton’s hometown of Virginia Beach to begin a new chapter of ministry. 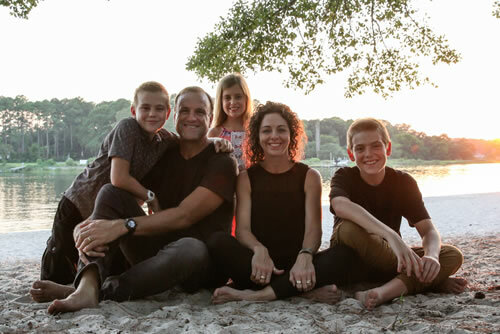 After serving for sixteen grateful years on the pastoral staff of a local church, God began to speak to their hearts and called them to a new work He had planned in Virginia Beach. They began prayer meetings with a few families which grew into Seashore Church, opening its doors in December 2017. Clayton and Romey live to see more of Heaven and to raise up a generation of revivalists who know and love God and serve Him wholeheartedly. Fully-filled and led by the Holy Spirit, this generation will make disciples of all nations. The Church is more than a gathering place for believers. It is the body of Christ, His family. We all have an important place in the family. It has been said that the greatest two moments in life are the day we are born and the day we discover why. Knowing our God-given identity and purpose is essential for every believer. This only happens when we live in intmate relationship with the Holy Spirit, and live obedient to and empowered by Him. Discovering our God-given identity begins by entering into intimate relationship with the Father. He created everyone of us with purpose. He is the One who will instruct our hearts and define His purpose in our lives. Man, at best, can only help in this process. This must be done by the hand of the Father if we are to be His children. Empowerment by the Holy Spirit is essential for the establishment of God's Kingdom on the earth. We are to continue the ministry of Jesus by preaching the Gospel and destroying the works of the devil. We will help people walk in freedom and wholeness, fully and continually filled with the Holy Spirit, so we can be faithful ministers of the Gospel under His anointing. This is available to every believer. Character developement is vital. Our character is our integrity before God. He is looking for purity in us, obedience, wholeness, righteousness, and honesty in the depths of our heart. Without purity of character the gifts He gives can be perverted. God is looking for people who will carry His anointing with purity. Spiritual gifts also need development. With the exception of Jesus, no human operated perfectly in every spiritual gift every time. It takes practice. A dad doesn't give up on his child who is learning to walk because he falls down. He encourages his child to get up again and again. Our Heavenly Father does not give up on us as we are learning His supernatural ways and exercising His gifts. Our church is a safe and nurturing environment for everyone to learn together. God's plan for the establishment of His Kingdom and the destruction of the devil's work is not restricted to just a few leaders in the church. God wants every son and daughter of His to rise up in His strength to fulfill His purpose. It will take an army of believers who boldly and obediently walk in His ways, filled with the power of the Holy Spirit to fulfill the Great Commission. We want to raise people up and send them into their workplaces, their cities, and the nations. We want to plant churches and other ministries. We want to see people boldly preaching and miraculously demonstrating the Kingdom of God in the power of the Holy Spirit.